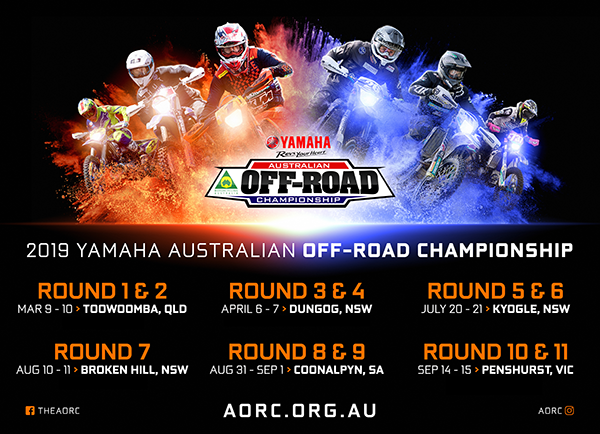 With only 22 days remaining until the 2019 Yamaha Australian Off-Road Championship (AORC) kicks off, Motorcycling Australia (MA) wishes to extend an invitation to all interested media to complete a media accreditation application. Situated in Toowoomba, Queensland (QLD) on March 9-10, Rounds 1 and 2 of the AORC 2019 season will be hotter than a QLD Summer! New and returning stars alongside reigning Champions will set the hearts of fans alight, as riders fight to take the lead in the Championship from day one. All media seeking to cover the event will be required to complete a media accreditation application via the AORC website, which can be completed here. All accepted media will receive contact from the MA Media Department in the weeks leading up to the event. Any queries can be directed to the Media Department via email (mediaprofficer@ma.org.au) and phone (03 9684 0528). All interested media must understand and accept all terms and conditions to successfully attend their desired rounds. Further details can be found here. Attending media must sign in upon arrival to the event with the present MA Media staff member. A high-visibility vest will be provided to all photographers and must be worn at all times when near all courses. For further information regarding Rounds 1 & 2, please click here.